Yay!! It’s Friday and Monday is MLK, so for most that means this is a 4 day weekend 🙂 I’m traveling to Houston today, but I wanted to quickly share something different than usual. I’ve never been a big beauty buff and I’m not claiming to be one, but every so often I get asked about what products I use or am currently liking at the moment. To be quite honest, I’m pretty basic and like sticking to the same easy routine throughout the week. Over the weekends (depending on what I’m doing) I like to glam it up a bit with a heavier eyeshadow/eyeliner and a bolder lip, but for the most part my everyday look is more on the casual & natural side. My recent addition to my routine has been incorporating a little highlight and subtle contour, but never overdone. 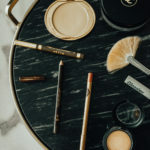 These are some of my favorite go-to products at the moment….